The Secretary of State has returned from Her Crucial Visit to Africa. In Some Key Areas such as Somalia there will not be any deviation from the Policies of the Previous Administration. But some Analyists are fixiating on One Area in Particular. And this is a region that has a direct impact on US Policy in the Region. The Region in Question is Nigeria. There are several crucial reasons why this task was undertaken by the Pentagon. First it sits on a key shipping lane. The Gulf of Guinea is a key route for the shipment of various products including Petroleum and sadly Narcotics. Secondly is the Petroleum. An estimated 27% of the Oil imported by the United States Originates in Nigeria. So this in itself could provide a key reason for why the US would Intervene in any Crisis Situation. According to the African Security Research Project the scenario was tested under United Quest 2008. In 2013 Rival Factions within the Government and Rebel Forces from the Niger Delta are Fighting for Control of the Oil Fields in the region. The Conflict has currently left the Government in Abuja near Collapse. This is an Interesting Scenario as it reportedly did not include the Religious Strife in the North of the Country between the Muslim Majority which is trying to implement Sharia Law and the Increasingly Vocal Christian Minority where it seems that when violence occurs between these two groups the fighting seems to grow worse. 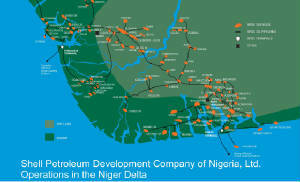 Above you see the Oil Holdings of One Company in the Niger Delta. Could US Forces be Used to Secure these sites in the Near Future? So What Could Happen in such a Scenario? One Scenario has 20,000 Troops landing in the Delta to Secure the Wells and Processing Facilities within a 60 Day timeframe. I wonder if this happens would the US Military have the foresight to plan for improvements in the Infrastructure in the Region? There were other questions asked as well such as would Diplomatic Pressure Work? Would Our African and European Allies support or oppose such an action? One Alternative Suggested South Africa and/or Ghana instead of US Forces. Having US Forces being seen as supporting a Corrupt or Repressive Nigerian Government could be seen as Counterproductive to what Goals the US Military was trying to achieve. There are Two Items that were interesting. First was that General Casey the US Army Chief of Staff presented the Results of this Game to both President Obama and Senator McCain. The War Game was run during the Campaign and secondly none of the Officers of AFRICOM were present during this. The Game Ended with a Coup by one of the Factions within Nigeria and thus US Troops were not needed. But does this mean that there may be a time in Place where US Troops will actually have to enter Nigeria? or the DRC or go back into Somalia? There will be more to this item in the Future.